The day is here!! 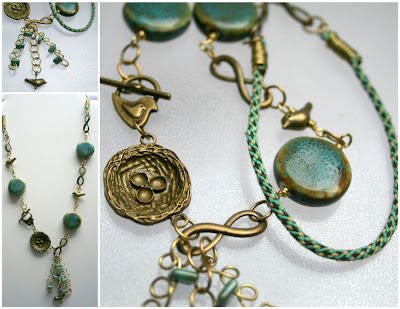 Lori's amazing annual event, Bead Soup Party #7 (1st reveal) is today. If this is the first time you've heard about the Bead Soup party and you wonder 'what is that?!' - it's quite simple. Participants from all over the world are paired up and they sent each other 'soup ingredients': any beads, findings, elements they choose. Mandatory: a focal and an art clasp. Upon receiving your 'soup ingredients', your partner needs to 'cook it': there usually is lots of simmering, because it's always interesting to work with someone else's ideas :) Then on the reveal day - everybody gathers and shows their resulting pieces. My partner this year was Stacy Pomerleau of Craft en Ville and she gracefully gifted me with beautiful ingredients, as I described them previously right here. I kept the ingredients on my work table and starred at them daily... nothing... Then a few weeks back I decided drastic measures are to be implemented if I want to have it done before the reveal. So drastic measures were implemented: one evening I just printed the picture of the ingredients, took the notebook out and... designed the piece! Can you believe I actually drew the design? As I am allergic to base metals - I needed a more friendlier way to 'hug' the neck... for some strange reasons I didn't even think of leather, the first thing that came to mind was 'Kumihimo' (probably because I've wanted to try it for some time). So try I did: that is my very first try at Kumihimo :) I *loved* it! I didn't have any silky thread, so I used some embroidery thread (luckily for me my house is full of pretty much every shade you can think of!) - but I like the end-result, the extension has just the perfect texture and width for this piece. Please make sure you visit the other participants (start with Lori, she's so wonderful and puts so much effort into this event!, then make sure you visit my partner too, Stacy) and see what everybody's journey has been! Thank you for stopping by - if you celebrate Easter this weekend I am wishing you a happy one! How pretty. I just love anything with birds and their nests! Beautiful! Love the wire work and bird theme! Such a sweet necklace - love the birds and nest! Love your story! The Kumihimo seems perfect for this design. I never tried to use kumihimo, it's a wonderful idea to use it this way. It fits perfectly into your design. Your necklace is beautiful! Wonderful colors and structures ! I love how you shared your sketch! I can't draw well so I can never put together a design like you. So impressed! The necklace turned out so pretty! You got me inspired to add kumihimo into my work! Lovely design! You did a great job and the sketch really made your idea come to life! Lovely necklace! The blues are so pretty and ties so well with the kumihimo braid! Love your piece and the sketch you made. I am so impressed that you could see it all before you made it. It came out just beautifully. Very pretty piece. Thanks for saring. Lovely piece. Love your use of kumihimo and the embroidery floss was a great idea. Love the wire work in the focal. Gorgeous results!! I love the asymetrical look and the tassel pulls it all together!! Beautiful. Congrats on the drawing. I just started doing that a few years ago - and pretty much do the same thing. Draw it - then wing it! Great piece. LOVE the kumihimo! Love the design! My partner sent me the same little birds - but i wasn't able to use them in my design - you gave me inspiration. How fun! What a wonderful design that lets the playful light feel of flight shine. Well done! Great jewelry! I love the sweet birds and where you put the clasp. I’m in the third reveal. Can’t wait. Beautiful! Love the color combination with the brass. Great design! I love anything with birds and nests. What a sweet piece! Beautifully done! I love the way you sketch out your design before you work!. Very beautiful ! I agree, it's a very sweet piece! Beautiful and I love that you tried something new!!! Beautiful necklace! The kumihimo with embroidery thread is just perfect for this piece and I particulary like how you made the pendant part. Alicia ,you did a beautiful job . Alicia, very awesome you are a fantastic artist very nice. So beautiful. I love how you drew out your design and the finished piece looks so much like it! What a gorgeous necklace! Alicia your necklace is beautiful. Good job conquering the brass and trying kumihimo too. I love the fact that you drew out your idea, and I have never tried to use kumihimo! Your necklace is beautiful. It went perfectly into your design. Like the nature design and brass. Love that you tried kumihimo. Beware, it can be addicting. Beautiful, Alicia! I love the light design with the little birds. Your kumihimo looks perfect to me. What a fun necklace. Great pieces to work with, and you did a beautiful job. Great design! I like how you added the kumihimo to your necklace. WOAH, that's the first time you did kumihimo? It's perfect! And way to go with trying something new! I love your sketch. I wish I had that talent! Thanks for being a cheerleader for the party! Very sweet!! Great job on the kumihimo, it looks wonderful in your design!! I like how you fit the beads together. The necklace flows really well and of course is very beautiful. What a fab piece. Congrats in trying something new. I love what you did with your soup. Very nice and I love your Kumihimo which adds so much to the design. You came up with a great piece and really did justice to the darling components you received. I don't find it at all odd that you drew and then didn't even look at it:) I'm always amazed at people that can draw something out anyway. I'm thoroughly impressed that you drew it out & then had it come out just as you had envisioned. Lovely! What a lovely, romantic necklace! I love the little birds! Mixed media design, I like it!!! Beautiful! I love that you sketched it out but then created from memory...it's wonderful! Your piece came out beautifully. Think I'm going to have to try sitting down with a pad and printout next time I'm blocked. Great use of your soup! Love your design of your sketch and the final result! Your comment..."Yeah, I know, I am strange :)"... aren't we all? The creative mind is just so! Mine is constantly churning new designs and information around! Love how this turned out. I did sketch my focal out this time but usually never sketch anything otherwise. Even your sketch was neat. Welcome to Kumi! You did a great job, and I love using embroidery floss, pearl cotton, etc. for braids. Beautiful! I can't believe that was your first attempt at kumihomo! How amazing! Great job and it's just gorgeous! Beautiful...love the brass and the kumihimo together! What a beautiful necklace, I love how you incorporated the Kumihimo. What can I say that has not already been said? Beautiful piece from a beautiful soup! Oh, how lovely! I just came in from the garden and this reminds me of the budding spring in my yard. :) Perfect. Lovely. I love the Kumi, too! Absolutely stunning, it turned out perfect and I love the kumihimo, a perfect addition, it is just the right touch. Beautiful, and so soft! Love it. Brilliant I love all the different mediums you incorporated. Very Beautiful. Makes me long for spring even more. Lots of lovely things - all so pretty. Alicia, your creation is GORGEOUS!!! I LOVE it! I think the Kumihimo came out beautiful and I'm glad to know you used embroidery floss! Since it's more readily available than tons of colors of beading cord, I stocked up at the last sale and had been wondering if I could use it for Kumihimo and you just answered my question! hehe Your work is great!!! I love how it all came together!!! You've made a beautiful design and I especially like the chain tassel and the kumihimo braid. So lovely ! I love how you sketched it out then... Didn't follow the sketch. XD That is so like me ! Oh, I just love this! I am always impressed by people who sketch their designs, even if they misbehave during the execution, LOL :P Nice concept, lovely necklace! I have never tried kumihimo either and now I am dying to try it. It fits perfectly with your piece. Love it. I love the addition of the kumihimo! It's a great thing to do isn't it! My 8yr old son got it in one demonstration and loves it too!!! Love your design! And the beads! Very beautiful necklace! Love it!! Thank you for the Easter greetings - May you have a very blessed Easter, as well. Alicia, I followed your advice and fixed both problems you bought to my attention. THank you very much! What a lovely design, love the birdies and the nest. You did great with your Kumi! I am proud of you too. Your design is handsome and the finished product so beautiful. Wow! You tried kumihimo. That's in my list for some day. Have a great day. Alicia your piece is stunning! I love the sketch you came up with! Also great way to try something new, love the kumihimo and I would love to give it a try sometime. I love the location of the bird and birds nest - inspired! You did a great job with the brass. I also cannot wear base metal and I usually use leather. Kumihimo is a beautiful idea. So glad you tried kumihimo, Alicia... embroidery thread was the only thing I had in the house the first time I did it, too! Your design is very pretty and makes good use of the range of components you received. Coincidentally I had bought similar figure-eight connectors (I call them infinity symbols) for last month's entry at ABS, so it was fun to see them used in your necklace design. Very nice :-) Love it! It's a beautiful necklace...the colors are so soothing and pretty for spring! I love the birdies!!! Very pretty, love the movement and the overall look, Great Job! Oh Alicia! I love your kumi! It is very addicting isn't it? I tried two different styles before I found the one I used for my piece. But it is so much fun. Love the design of the necklace. Awesome work!!! Those little birds are adorable and the nest is fantastic! Love the kumihimo braid idea for the extension,it all flows beautifully. Wow so pretty. You are one creative woman, nice job! Alicia. this is so pretty. The kumihimo is amazing, can't believe you! Wow. so pretty - truly! Great idea with the kumihimo. Never would have thought to use embroidery floss for the cord. But that's the fun of BSBP..learning new things. Great job on the necklace though. This is really lovely. I like your bird theme :-D Now I want to try kumihimo too! As a brass lover myself, I'm glad you were able to make such a lovely necklace, and prove that brass is, indeed, lovable! Well done! I do the same thing. I will draw up a design and then forget to bring my sketchbook downstairs with me. I just love how your necklace turned out. I am also a newcomer to brass but I am loving what I can do with it and there are so many gorgeous chains out there in Brass. I love your wire work! I also work with embroidery threads and love the color combinations you can get. Beautiful work!! Love the mix of textures in your necklace. Kumihimo is great, it can be used with any type of fibre, just wait til you try it with beads! Great design! I really love how you added the bit of Kumihimo, I have always wanted to try it too. I love the kumihimo! It goes so well with the beads. I also love the little bird beads, so cute! A very creative design-nice wire work. Thank you for sharing your talents with us. Cute, cute, cute! And great work with the kumihimo -- it's a great touch for the piece. All the elements work so well together - lovely work. Pretty necklace! Perfect for spring! Love the design! I WISH i could sketch a design like that (it rarely works for me) Thanks for sharing the sketch! Very nice design. I have never attempted to sketch out a plan. Your kumihimo is a wonderful addition to this soup ! That is lovely, beautifully coordinated too! I specially like how you have used Kumihimo. Kumihimo is probably the only thing I do with yarn / thread that does not make me want to kill myself :-) I find it a very therapeutic thing to do. really lovely, the birds are so cute and your Kumihimo is fab! 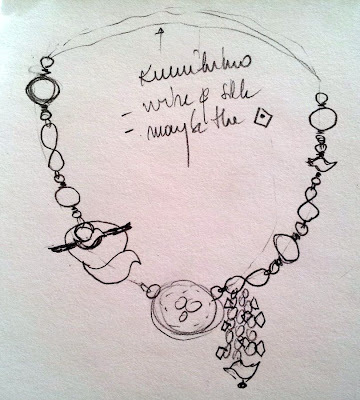 Cool seeing how your sketch turned into a necklace! That is a beautiful necklace. I too have recently learned kumihimo (except how to spell it without looking) and it is a beautiful technique. I am so impressed about how anyone can draw out a design. I never know where the "ingredients" will take me. I guess I let the design control me rather than controlling the design. You did a wonderful job. Ariving a little late but your necklace is lovely, I think the little birds worked in rather well! Finally got a chance to go around all the reveals - traveling can get in the way! Pretty colours. Am impressed you worked in a new skill - kumihimo, and a smart idea to combat the allergic reaction. Design challenges are very exciting to work with. Wow, your muse was working overtime! I love how you placed the clasp near the front and made it part of the design. How I wish I could be as successful with asymetrical design as you are! I always design with a bead board and it never occurred to me to sketch my design first--but you've inspired me to try that out. By the way, I would have guessed that you'd always worked with brass. Love it! First time at kumihimo you say?! That's a amazing attempt, you're a natural! Oooh, it turned out beautifully. I especially like your embroidery thread kumihimo. I've done the technique with beads and with scraps of fabric, but I hadn't considered the thread. That's crazy because like you I have a TON of it around here! Thanks for the tip. Now if I can only make mine as awesome as yours! Its amazing and lovely pendant that you design.Beautiful love the wire work and bird theme.you can also use silver vial pendant for more attractive looking.